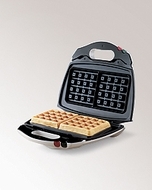 This waffle baker really works. Pour in the batter, close the lid, and flip once--either sideways or front to back--and in five minutes two thick and fluffy Belgian waffles are ready. It's amazing. The flipping creates an air pocket in the center of the waffle that's pure chemistry. There are also several features that make using this device almost foolproof (though there is a slight learning curve). A well-written recipe book is included that provides some delicious waffle recipes and great baking tips, even if you're using a prepackaged mix. The indicator light is also great: it turns green when the baker is ready for the batter, eliminating guesswork. And the nonstick surface is super--when your waffles are done (five minutes is a good benchmark, and the lid should lift easily), they peel off the grid smoothly. Cleanup is easy, too. A covered hinge and a batter channel prevent messy spills, and the nonstick surface wipes clean with a sponge or a soft brush. Best of all, the waffle baker stores upright. All in all, this is a dandy addition to any kitchen.